But don't worry you will be redirected to the page you've requested. 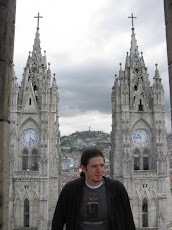 I can’t believe I’m finally here in Quito! This city is absolutely beautiful, with tons of different colored houses and its weaving landscape. It’s not like a U.S. city in which everything shoots up and overpowers the senses in a condensed concrete jungle. The city sprawls out through the mountains’ valleys and practically screams its foreign strangeness. The only drawback I’ve found so far was the disaster we had to survive going through customs. Some planes were delayed, so several huge flights arrived at the same time. It was a mess with people yelling and pushing to get to their luggage and through the customs station. The loud buzz of Spanish really helped Ecuador sink in, giving me a bit of culture shock as I stood out like a sore thumb. Overall, the first day was a success. 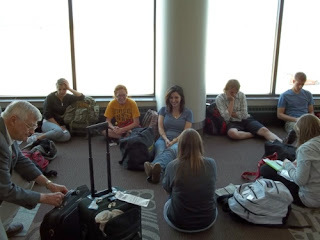 We spent a lot of time waiting around in airports and getting to know each other. I’m sure I’m going to make some really great friends in this adventure. I can’t wait to see what we can do for the people here as well as what we can experience and learn from all Ecuador has to offer. 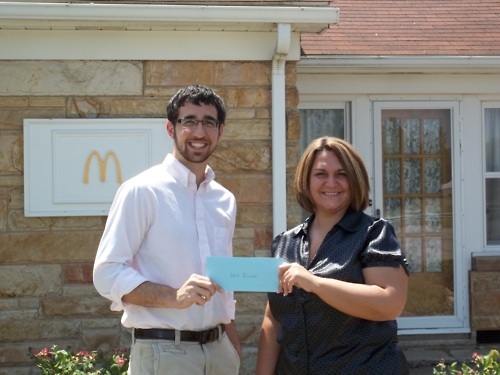 A huge thank you to McDonald’s, especially Beth Lunsford and my local McDonald’s owner Vince Tanner, for its huge donation to the people of Santa Ana, Ecuador. Words can not express my gratitude for your contribution to my project. Kentucky Partners of the Americas (a chapter of Partners of the Americas) has enjoyed a partnership with Ecuador since 1965. (Currently, Kentucky works with areas of Ecuador including Quito, Santo Domingo de los Colorados, and the Amazon Basin. Kentucky-Ecuador Partners has been one of the most progressive and most productive partnerships. The Kentucky chapter is supported by volunteers from most regions of the Commonwealth. Members are located in Winchester, Lexington, Louisville, Murray, Richmond, Whitesburg, Danville, Frankfort, Bowling Green, and other cities. Michael Barns, a resident of Lexington, Kentucky, has composed original music since age sixteen, releasing his first songs for his solo project "Systematic Shut Down" in 2001. Since that time, Michael has released three compact discs of original music drawing from the genres of metal, industrial, alternative, and acoustic to create a unique sound synthesis, with deeply personal and emotional lyrics. He performs all of the instruments in his work and has personally engineered and produced each release. Barnes designs and maintains his own website, www.michaelbarnesmusic.com, where he has a fan base drawn from regions all over the world. His latest release, All I Lost Was You, is a twenty-track effort, spanning the last five years of creative development. This is a Flickr badge showing public items from the KentuckyEcuadorPartners group pool. Make your own badge here.